I’ve been waiting to make this project with just the right style paper and Paris Flea Market was it! 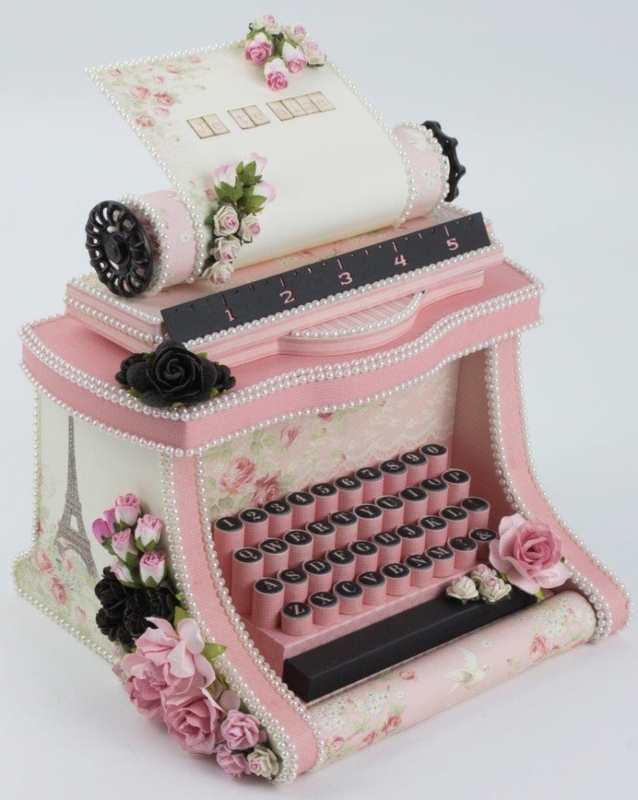 This typewriter box was completely handmade using thick poster board and the lovely pinks from the collection. The hinged back can be opened to reveal a box. There are so many crafting possibilities with these gorgeous papers! Best wishes for a great day! I was looking to see if there was a reply to where I can find the typewriter project and also the castle project. These projects are so beautiful. Does anyone in the States sell the Pion Paper and embellishments? Thank you for your help and your beautiful work. This is absolutely stunning! Do you have a video tutorial? If not, you really should. I’d love to learn to make one for my best friend who is moving out of the country. Please let me know if there’s a video tut or a pattern. Thanks for sharing your amazing work! This project is no doubt the most gorgeous ever. The whole idea of the typewriter is so clever, all the embellishments used, the choice of papers and colors is just so perfect. Absolutely Stunning! This is amazing. I love it. Wow, Tara this is amazing and so inspiring and I agree these are the right papers. this Project is very very Special. How can i purchase the instrution for this lovely Thing. This is amazing, can I purchase the template and instructions? I work in an office and this is amazing. Thanks to all for your comments for this project! I appreciate them all!